Updated Thursday October 25, 2018 by NLBA. 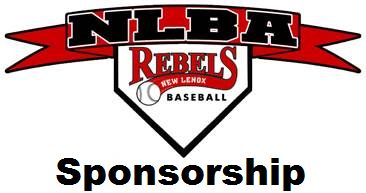 NLBA Sponsorships are filling up, act quickly so we can help promote your business and begin partnering with one another. The Rebels organization is home to over 90 in house teams in the spring, 20 fall ball teams, 13 full time travel and 8 part time travel teams. In addition to our seasonal play we also host three tournaments a year. Our Memorial Day tournament is one of the largest in Illinois hosting over 75 teams and 1,000 families yearly. The New Lenox Rebels are proud to offer field and individual team sponsorships in 2018. A field sponsor will have the opportunity to display a 4x6 banner (included in sponsorship) on one of our 15 fields for two years. The fields operate from April 1st through October 31st. Individual Team sponsors are also available. The fee is $300.00 per team payable by check to NLBA ($350.00 if choosing the website ad option). Take advantage of the discounted sponsor fee of $275.00 ($325.00 if choosing the website ad option) if paid by February 28, 2018. There is only one fee of $50.00 for the website ad if sponsoring multiple teams. Sponsorship to a particular division/team will be assigned on a first-come, first-served basis. 2 years of fence space for advertising on one of our 15 fields. 4x6 advertisements Banner for 2 years. 1 team sponsorship for the 1st year of participation. Sponsorship plaque for the 1st year of participation. Web advertisement on NLBA web site during 1st year of sponsorship.